Following the death of their captain, the men of the barquentine Herbina were described as an “unchristianlike” crew. The judgement was passed at an inquiry while the ship lay at anchor off Passage East in February 1892. But was it fair, or even accurate? I will leave that to you to decide. Over Christmas the brother in law, Bernard Cunningham, asked had I ever noticed the foreign captain’s grave in Crook, and wondered if I knew the reason he was buried there. Funnily enough I had photographed it previously, as you do!, but had never followed up on the research. 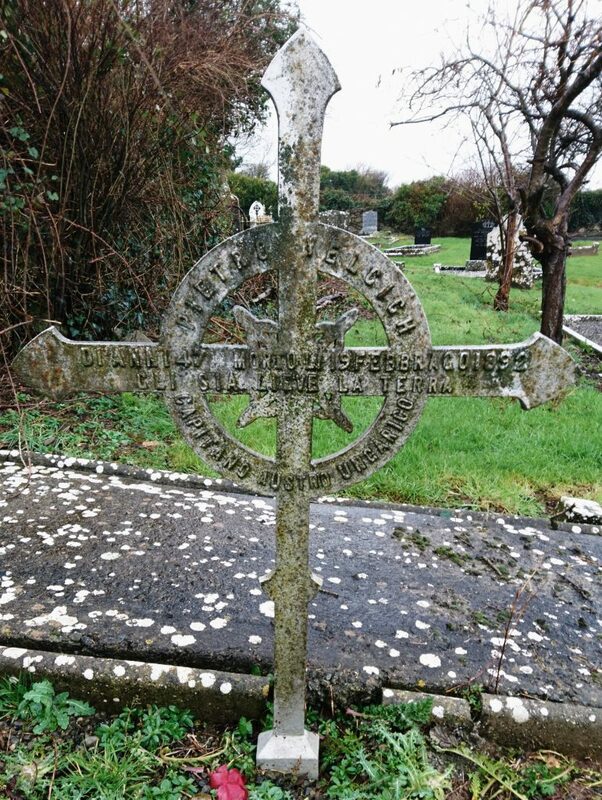 The grave belonged to Petro Valeiste (Velcich on his grave marker) , sea captain and part owner of the Herbina, a three masted barquentine of the port of Trieste (then part of the Austro- Hungarian empire). The ship was sailing from Liverpool to Buenos Aires with a cargo of coal. She departed from Liverpool on Thursday 18th February but ran into a storm on the afternoon of the following day and while the crew struggled to manage the sails, and a hired pilot kept the ship on course, the captain slumped to the deck and died. The Herbina was one of 11 ships that entered Waterford harbour following the storm and the Munster Express gave a vivid description of the scene with ships in a sinking state, the pilot boat and pilots run ragged in providing their services and the Dunmore East lifeboat on duty in case of emergency. 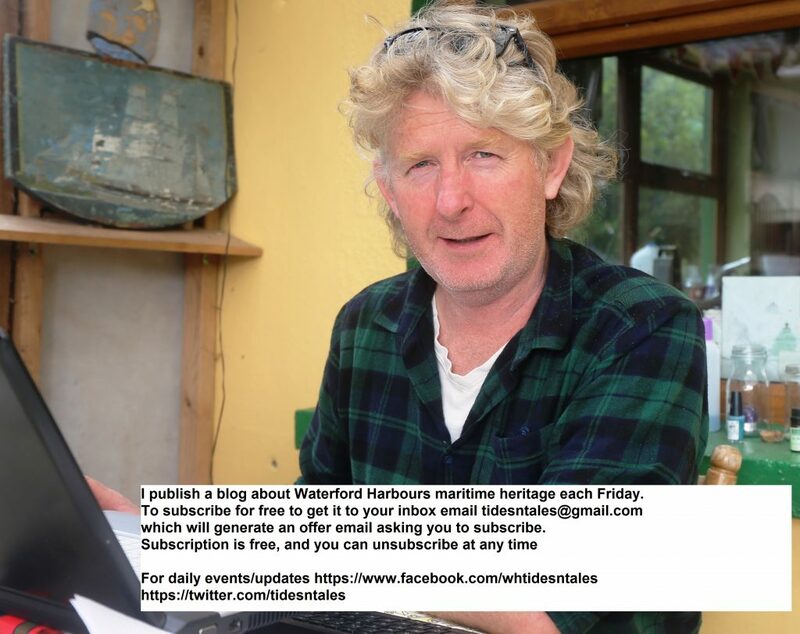 When the Herbina was finally safe at anchor the local police barracks at Passage received news (presumably from a pilot) that the captain of the vessel was dead, and Dr Jackman from Dunmore East was summoned and went onboard. Dr Jackman, however was not prepared for the strange sight that greeted him. For the captain lay where he fell and not a crew man would come near the body, and he had to place a shroud over the body and lift it into a coffin without a hand being lifted to help by the crew. As the body was lowered down into a waiting hobbler craft, again the crew would not help. News of the crew’s behaviour must have quickly spread. A follow up inquest was held in Passage East on Tuesday 23rd February. It was overseen by Mr E Power, Coroner, and the following made up the sworn jury; Capt Kelly (foreman),P Hanlon, J Kennedy, W Power, J Kavanagh, M Hanlon, Thomas Ryan, J Donnelly, James Rogers, P Cashin, M Kavanagh & John Barrett. The first evidence was supplied by the Channel Pilot* Philip Barrio who explained that on Tuesday 16th February he was engaged by the dead captain to assist in the navigation down the Irish Sea. However as the weather was stormy, they delayed departure until Thursday 18th. By the late Friday afternoon of the next day the weather again turned against them. The captain consulted with the pilot on his decision to take a reef in the top sail, but to this the pilot objected suggesting he needed to reduce his sail considerably more. Two men were already aloft and the captain decided to order all his remaining crew aloft. Even as they climbed the rigging some of the sail was torn away by the wind. As the crew worked diligently aloft, the pilot took the wheel. However at some point he noticed the captain grab his chest and stagger away towards his cabin. He explained that he was too occupied to take much notice of the man, but at one point noticed him slumped and thought he may be asleep. On being challenged by his apparent lack of concern for the captain, the pilot explained that he had seemed to be in the best of health and it had not occurred to him that he was unwell. He was also much absorbed in ensuring the safety of the ship and her crew, as the weather was so bad. An obviously perplexed jury put question after question to the pilot. Had the captain been in dispute with the crew? Were angry words spoke? Had he been ill? Had he drink taken? To all the pilot stated in the negative. A doubtful jurist also expressed surprise that the pilot was given the wheel. Rogers went so far as to say he was not satisfied with what he was hearing, but was overruled by the coroner. First mate Gorgurevich Natals was then called to give evidence and he explained how on fulfilling his earlier instructions he descended to the deck to get further orders. He came aft and noticed the captain slumped over. He perceived that he was not breathing but felt warmth over his heart and called to the cook to bring some alcohol. This was rubbed into the chest of the dead man, but did not revive him. 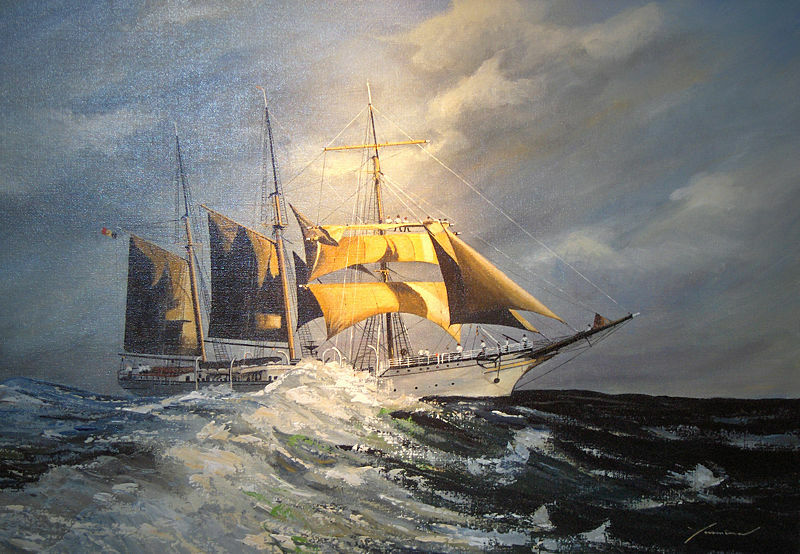 The jury, through questions ascertained that it was his first trip under the captain, that he was too preoccupied in the rigging to have seen what was happening on the deck and that he had heard the captain say he had been unwell prior to his joining the ship but he was in the best of health since the mate had signed on. Whatever transpired on the Herbina on that fateful voyage many members of the jury remained unconvinced that they were hearing the full truth, but the coroner seemed satisfied and ruled that on the evidence given that the captain had died from natural causes, heart failure. Later on in the day the remains were interred in the graveyard in Crook. No further details are given. Perhaps his crew went to pay their respects, maybe flowers were laid, maybe nothing at all apart from a priest and the gravediggers. I have found no other mention of the ship or the crew. 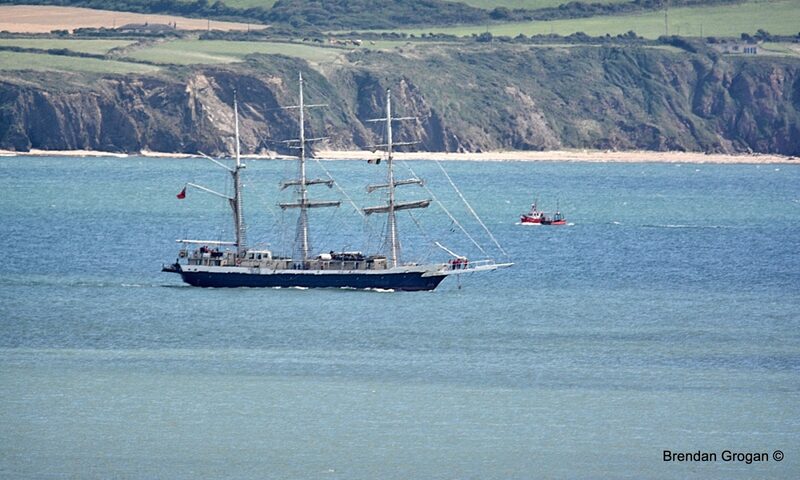 Presumably she sailed once a replacement captain was found. Given how superstitious sailors could be, we might consider him a brave man indeed to sail with the men labelled as the “unchristianlike” crew. *I had hoped to find a link to describe the work of a channel pilot, but couldn’t find a specific description, if anyone could direct me to same I’d appreciate it. Was there no post-mortem examination ? There would not, I think have been a Pathologist here in Waterford at that time. Indeed, I am unsure when exactly Pathology became a distinct specialty in it’s own right. My late father-in-law Louis Foley was a GP in Tycor (I practice as a GP in what was his home). He told me that as a young GP in Waterford in the late 1940’s he did some post-mortems. As he also had a post in The Infirmary, it might have been a component of that job. The first fully trained Consultant Pathologist to Ardkeen was Dr. Kieran Cuddihy, appointed in the 1960’s, I think. Yes Tadgh that is correct. Dr Kieran Cuddihy was the Pathologist and Head of the Pathology Laboratory at Ardkeen Hospital from 1965 until his retirement in 1987. During that time he carried out post mortems all over the South East including those on the victims of the Tuskar Rock plans crash in 1968. On occasions he also deputised for the State Pathologist. A very popular man he lived in Kilkenny and was doctor to the Kilkenny hurling team for a number of years.